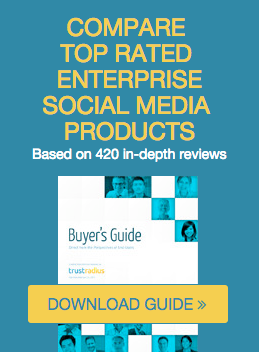 TrustRadius – the new business social network for professionals to share candid and robust intelligence about enterprise technologies – has been gathering feedback from social media management software users. We define social media management software (SMMS) as a set of tools allowing an organization to connect multiple social media accounts and manage, monitor and analyze interactions from a single dashboard. Most web-based SMMS apps permit some level of listening for brand mentions, real-time and automated posting to multiple channels, and the ability to run social marketing campaigns. They almost always also include an analytics package allowing the relative success of campaigns to be measured. In this report, we present early findings from our private beta, which document the problems users of these products are trying to solve, the tools they use, and their satisfaction with those tools. The findings are based twenty six product review interviews collected in-person, over the phone and via the web from professionals at twenty three companies. Reviews on eleven distinct SMMS products were collected. The purpose of this report is more to illustrate emerging insights and our research approach versus providing quantifiably definitive guidance. It is an emerging software category with multiple vendors, none of whom is yet dominant. Technology price points vary enormously from free to thousands of dollars per month. Technologies are still maturing. Many vendors purport to do many things, but in reality, there is no single holistic solution. Frequently, users find that often specialized tools are required by purpose. While most people associate SMMS with marketing, in reality, social media use cases are getting more and more diverse including customer support and sales, and there have been some interesting new technologies emerge in those areas. There have been several acquisitions of SMMS vendors by large software companies like Salesforce, Oracle, and Adobe. This has sometimes shifted the focus of product development from feature innovation to integration of the acquired tools into a larger product portfolio. We also believe that traditional analyst firm coverage of this space so far has not been that helpful. Gartner does not explicitly cover the SMMS category, but instead has focused on areas such as private social community platforms like Jive and Lithium, designed for knowledge sharing functions such as instant messaging, Q&A, collaborative editing and document management, etc. They have produced a magic quadrant on what they refer to as “Social CRM” which covers some of these collaboration vendors (see figure below). But what is anyone to make of this? By my estimation, this contains a collection of different software products with only a tenuous relationship to each other. In addition to several social community platforms, the quadrant features—in no particular order—enterprise content management, a review engine, online surveys, CRM, social media monitoring, and sales intelligence. Placing this jumble of solutions in a single bucket and trying to compare them against each other seems like a rather pointless exercise. It’s difficult to see how this could ever benefit anybody including the vendors. Forrester has more focused coverage of the space, and has concentrated largely on high-end enterprise listening platforms represented by vendors like Radian6, SDL, and Visible Technologies. The social media-focused research firm, Altimeter does cover the category in considerable depth (http://www.slideshare.net/jeremiah_owyang/smms-report-010412finaldraft) and this research has garnered a lot of attention and discussion. However reviewing these existing sources, we felt there was opportunity to present the space from a more user-centric perspective - to highlight the perspectives of the “crowd” versus espousing our own. Rather than group all SMMS tools into one bucket for comparison using subjective criteria like vision and ability to execute, our approach is to report the variety of use cases we uncover through our interviews and to annotate why professionals chose the software applications that they did, and how those packages are performing against the specific use cases. Think of this less as a landscape review, and more as dispatches from the front. 1. Different business functions often have very specific social media needs and there is increasing specialization of software to serve these needs. Listening to customers to understand what they are saying about your products or services is one of the primary marketing use cases. This incorporates things like scanning for potential PR crises, listening to trending industry topics, listening to what is being said about your competitors, and also identifying sales opportunities. The problem here is typically the sheer volume of data being streamed. It’s sometimes difficult to sort the wheat from the chaff. Some of the more fully-featured, and expensive, products like Radian6 and Alterian SM2 typically include sentiment analysis which attempts to provide automatic categorization of comments into positive or negative buckets. However, high levels of accuracy are extremely difficult to achieve through automation of this kind. A second common marketing use case is scheduling posts to social media channels in advance and automating publication. Publishing functionality makes it easy to draft and publish posts to multiple channels according to a pre-defined schedule. This is particularly important where multiple marketers are promoting different products or services across many different channels. The ability to plan a shared publishing calendar and schedule posts so that there is an appropriate time lag between each one and to make sure that messages are congruent with each other is often crucial. This functionality has become relatively commoditized: most tools now allow marketers to do this. Using social media to support Marketing Campaigns is related to publishing but goes beyond posting to running fully-fledged marketing campaigns where recipients are encouraged to interact with content. The main functionality here is content creation (usually in support of marketing messages on other channels), and moderation or engagement with people who respond or share content. Most platforms allow for the creation of customized social content for Facebook Pages, polls or sweepstakes, and many tools like Spredfast allow for centralized content libraries where users can pull pre-approved content for specific campaigns. Virtually all SMMS vendors provide some kind of pre-packaged social data reports that show things like number of fans, likes, re-tweets, and comments. But these metrics are often less important than measuring reach. This means understanding things like which content is shared with others and how often. One option here is to simply provide APIs so that the user can leverage 3rd-party analytics packages, but basic integrated reporting is a must. Many people we talked to use one platform for content creation/scheduling, and rely on a separate listening platform for advanced analytics. One significant problem here is that unstructured social data can easily turn into another data silo. Certainly social media data is useful in providing insight into consumer opinion; it is less helpful at predicting when a potential customer is ready to buy. Social data needs to be collected and analyzed in conjunction with data from other channels like web and email to provide the whole picture. “We use Radian6 for analytics as the analytics functionality in Radian6 is much deeper, and it can search across a wider range of channels, including blogs. In addition, we also use another product called Simply Measured to perform an even deeper level of social analytics. Simply Measured has a powerful reporting engine that allows us to build custom reports to drill into any metric we wish. The reporting capabilities in HootSuite are much more pre-packaged”. Another newer use case for social media tools is customer care. Increasingly consumers are aware that the quickest route to a customer service response is not to call the company and open a support ticket, but rather to tweet the issue and have an agent respond to the tweet in almost real time. Sometimes the real purpose of these tweets is just to vent a customer’s frustration and is not necessarily designed to elicit a response, but recent research from Nielsen and McKinsey indicates that almost half of all social media users have turned to social channels to resolve customer service issues, and about 30% of social media users prefer contacting customer service through a social channel rather than by phone. Some huge brands like Nike, Blackberry, American, Samsung, and Dell use the social channel (primarily Twitter) as a primary support channel, and there are good reasons for doing so. A recent report from American Express revealed that customers electing to use social media for customer service are the most engaged and vocal customers, and are also the prepared to spend substantially more (21%) with companies they believe provide great company service. Clearly though, once rapid intervention expectations are established, they can be difficult to sustain. Many vendors are now talking up this use case for their products. Community platforms like GetSatisfaction and Jive are quickly moving into this area: For example, GetSatisfaction allows companies to add a special “customer support” tab to their Facebook fan pages so that customer support issues are automatically routed to the customer support team for resolution. Similarly, Jive recently introduced an entire “Social Customer Service Solution”. Zendesk too provides functionality that allows customer service tweets to be automatically turned into Zendesk support tickets. In May of this year, they also partnered with Sprout Social to offer more social capabilities from within their platform. More recently, social channels are being leveraged to makes the sales process more efficient. The area of “social sales” is still emerging, but there have been some significant developments. For example, SMMS vendors like Hearsay Social have been focusing on empowering distributed sales teams in regulated industries like insurance and banking to engage with prospects using approved social media content from centralized content libraries. Hearsay tools are specifically designed for companies that centrally manage a brand, but have branches (franchised or not) or representatives in local markets that sell to consumers. Companies structured in this manner could be in financial services (the compliance capabilities are particularly interesting here), retail, real estate, hospitality, and other franchised or direct sales businesses. The basic use case is where a distributed insurance sales agent posts appropriate, approved content to her Facebook page in order to win new sales. This is proving to be highly successful. Vendors like InsideView offer simpler capabilities for B2B: the goal here is to take the chill of cold calls by providing sales people with intelligence on target companies with data from a variety of sources including social media. Vendors from adjacent spaces like marketing automation are also beginning to talk about “social selling” as an extension of their platform capabilities. For example, Eloqua has recently published several thought pieces on the importance of the social channel for building sales relationships. A new entrant in this category is SocialPandas. This new company, which recently received funding from True Ventures, feels that the power of social media can be applied to the sales function to help sales people cut down on the time and energy they now spend on tracking down information and leads. There will likely be more activity to come in this category as social expands beyond the marketing badlands into other critical parts of the organization. The ubiquity of the freemium model in this space means that the majority of people we spoke to upgraded to enterprise-level tools from either free or inexpensive offerings from the same or a different vendor. Many companies have not been using their current tool set for longer than a year, indicating that there is still considerable churn as customers seek the right set of platform capabilities for their specific use case(s). Anecdotally, many social media managers also seem to be in the midst of evaluation projects to select new tools. There is some difference in approach as vendors either position themselves as best-of-breed or suite vendor platforms. Vendors like Spredfast and HootSuite Enterprise are building out platforms that offer a wide range of capabilities. But the high-end listening tools like Radian6 and Sysomos are currently more specialized, concentrating on the listening, sentiment analysis and sophisticated analytics. This difference in approach is evident in that many companies are using broad-capability platform tools for publishing and marketing campaigns, and completely different tools for listening and analytics. Use cases for SMMS tools are broadening and infiltrating other departments beyond Marketing. As we have seen, Customer Support and Sales are two of the newer areas where there is increasing activity and interest. We are still in a private beta, but welcome new voices knowledgeable about social media tools. If you would like to participate by sharing a review about a social media tool that you have used, please click below join our beta. Please provide your LinkedIn profile information so that we can screen you as we’re only letting buyers/users of enterprise technologies in currently.